A Bug's Life is a video game based on the Disney/Pixar film of the same name. It was released for various systems in 1998 and in 1999. The game's storyline is similar to that of the movie, with a few changes. After completing levels the player can unlock real clips from the movie. The Game.com, Sega Saturn, and Dreamcast versions were cancelled. In March 2011, the PlayStation version was released on the PlayStation Store for the PlayStation 3 and PlayStation Portable. Most of the film's main cast reprised their roles in the game, with the exceptions of Julia Louis-Dreyfus, Kevin Spacey and Denis Leary, who were replaced by Jodi Benson, Andrew Stanton and Nick Jameson as Princess Atta, Hopper and Francis, respectively. Though the film was Roddy McDowall's final theatrical performance, the game was his final work overall before his death. A Bug's Life is a platform game with different goals in each of 15 levels. Most of the goals deal with getting the main character, Flik, to do events that match the storyline of the movie. When the player finishes a level, that player can proceed to the next level. Each level starts with a short animation from the film. If the player collects all bonus items in a level, a bonus scene is unlocked. Bonus items include 50 pieces of grain, four letters that spell F-L-I-K (similar to the Nintendo 64 and PlayStation versions of Disney's Tarzan) and permanently finishing off each enemy bug. Floating telescopes guide the player through each level. Throughout each level are a variety of seeds. Some seeds are partially buried in the ground. These seeds can be transformed by Flik into a specific kind of plant that can help him solve problems within the levels. Flik can increase the number of plants he can grow by collecting colored tokens scattered throughout the levels, with a token's color determining what type of plant can be grown with it. Obtainable throughout the levels are a series of berries which can be thrown at enemies to kill them. How long the enemies stay dead, once hit, depends on the kind of berry Flik throws at it. The player starts out each level with the red berry. There are two ways to collect the super berry, homing berry, mega homing berry, and gold berry: (1) by finding the actual berry somewhere in the level or (2) collecting purple tokens, turning a seed purple, cracking it open, and obtaining the resulting berry that way. One purple token is required to obtain a super berry from seed, two purple tokens to obtain a homing berry, three purple tokens to obtain a mega homing berry, and four purple tokens to obtain a gold berry. Some levels do not contain certain berries; the only way to get those berries is to collect enough purple tokens to get that berry from a seed. Flik's grain machine is present in certain levels. If the player finds the machine and puts it on, it will destroy nearly any enemy (cannot defeat worms, roaches and centipedes) that comes into contact with it. The machine is also handy in collecting grain at distant ranges. When Flik is in the machine, he cannot jump. A Bug's Life was met with generally unfavourable reviews. Aggregating review website GameRankings gave the Nintendo 64 version 54.40%, the PlayStation version 55.73% and the Game Boy Color version 36.63%. GameSpot gave the PlayStation version 2.7 out of 10, concluding that it was "obvious that Disney was more interested in producing a $40 advertisement for its movie than in developing a playable game." However, the same site later gave the Nintendo 64 version a score of 6.1 out of 10, stating that "Children looking to relive the fun of the movie should be pleased with the simplicity of the game." IGN gave the Nintendo 64 version 6.8 out of 10, praising the presentation and sound by stating that it had an "Upbeat, cheery look and feel very much like the movie of the same name" with "Cheery, happy tunes and strong sound effects" but criticised the gameplay by saying the controls were sluggish with "stuttering framerate" and "tired gameplay mechanics" while they gave the PlayStation version 4 out of 10, criticizing the gameplay as slow and awkward but praising the presentation as cinematic. The same site later gave the Game Boy Color version a score of three out of ten, calling it "short and repetitive" and "below average". 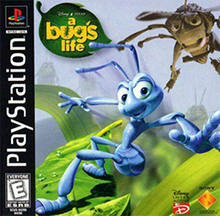 ^ "A Bug's Life (PSOne Classic)". PlayStation Store. Retrieved 8 January 2017. ^ a b "Disney/Pixar A Bug's Life for PlayStation". GameRankings. Retrieved 28 February 2013. ^ a b "A Bug's Life for Nintendo 64". GameRankings. Retrieved 28 February 2013. ^ a b "Disney/Pixar A Bug's Life for Game Boy Color". GameRankings. Retrieved 28 February 2013. ^ Marriott, Scott Alan. "A Bug's Life (PS) - Review". Allgame. Retrieved 2 January 2014. ^ Marriott, Scott Alan. "A Bug's Life (N64) - Review". Allgame. Retrieved 2 January 2014. ^ Cook, Brad. "A Bug's Life (GBC) - Review". Allgame. Retrieved 2 January 2014. ^ Alex C (August 15, 2001). "PlayStation Review: A Bug's Life". Computer and Video Games. Archived from the original on June 10, 2008. Retrieved 3 January 2014. ^ "A Bug's Life (PS)". Electronic Gaming Monthly. January 1999. ^ "A Bug's Life (N64)". Electronic Gaming Monthly. 1999. ^ "A Bug's Life (PS)". Game Informer (69): 69. January 1999. ^ "A Bug's Life (GBC)". Game Informer. 15 December 1998. Archived from the original on October 20, 2000. Retrieved 3 January 2014. ^ Reppen, Erik (July 1999). "A Bug's Life (N64)". Game Informer (75): 62. Archived from the original on February 29, 2000. Retrieved 3 January 2014. ^ Air Hendrix (1998). "A Bug's Life Review for PlayStation on GamePro.com". GamePro. Archived from the original on March 18, 2005. Retrieved 3 January 2014. ^ Zimring, Jason (December 1998). "A Bug's Life Review (PS)". Game Revolution. Retrieved 3 January 2014. ^ a b Stahl, Ben (2 June 1999). "A Bug's Life Review (N64)". GameSpot. Retrieved 2 January 2014. ^ a b Broady, John (12 November 1998). "A Bug's Life Review (PS)". GameSpot. Retrieved 2 January 2014. ^ a b Casamassina, Matt (1 June 1999). "A Bug's Life (N64)". IGN. Retrieved 2 January 2014. ^ a b Nelson, Randy (19 November 1998). "A Bug's Life (PS)". IGN. Retrieved 2 January 2014. ^ a b Cleveland, Adam (8 February 2000). "A Bug's Life (GBC)". IGN. Retrieved 2 January 2014. ^ "A Bug's Life (N64)". Nintendo Power. 121: 110. June 1999. ^ "A Bug's Life (GBC)". Nintendo Power. 116. January 1999. ^ "A Bug's Life". Official U.S. PlayStation Magazine. 1998.